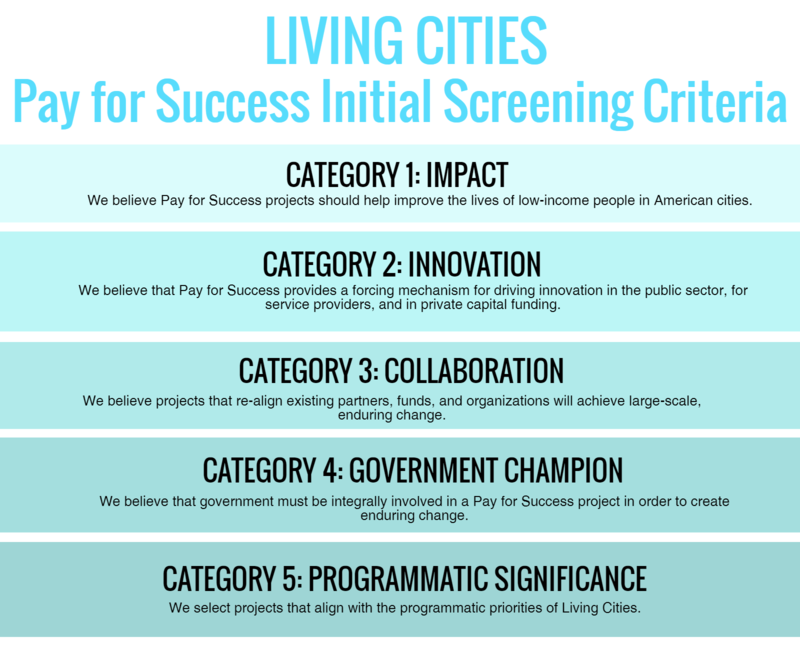 The Initial Screening Criteria infographic provides an overview of how Living Cities decides which Pay for Success projects to consider investing in. The criteria is listed in a check-box format for the use of our networks and partners. The Pay for Success (PFS) field continues to gain traction. As one of the earliest investors in PFS transactions in the United States. Each project we’ve been involved with–whether or not we ultimately invested— has informed our thinking on the potential PFS has to be a tool to get better outcomes for low-income people. Now, with six investments under our belt, the Living Cities team has been in a unique position to grow the field, contributing our lessons and resources for future investments. Our initial screening criteria designed to assess whether a project is a good use of the PFS model, and if it is a good fit with Living Cities’ programmatic priorities. We look for: impact; innovation; collaboration; a government champion; and programmatic significance. Download the full infographic and get a check-list of all the elements Living Cities considers when deciding whether to invest in a Pay For Success transaction. Our Team honed the criteria based on feedback from staff, members and our Blended Catalyst Fund investors. Our initial screening criteria will likely evolve as we continue to learn. But in the Living Cities spirit of open-sourcing, we’re sharing our criteria now in the hopes that others will be able to use it to inform their work. Please submit your feedback, stories of use, or suggestions in the comment section of this resource.